Leave it to the Germans to make things interesting. Spain has gone out of its way to downplay the rematch of the 2008 European Championship title game in Wednesday night's World Cup semifinal, refusing to even acknowledge the grudge match factor. "We want revenge for 2008," Podolski said Tuesday night. "When you are in a final you want to win. We still think about that defeat, and it still hurts. We want to reach the final and we'll do all we can to achieve that." Spain ended a 44-year major title drought with its 1-0 victory over Germany two years ago - a win that wasn't nearly as close as the score indicated. But Germany is a far different team now - in age and in attitude. Youngsters such as Mesut Oezil, Sami Khedira and Thomas Mueller have given Germany the speed and sharpness it lacked in 2008. Despite their youth - with an average age under 25, this is the second-youngest team Germany has ever sent to a World Cup - the Germans are playing with discipline and a seamless chemistry that makes their plays unfold like a symphony. Their spacing in the midfield is awe-inspiring, their passing so exquisite it almost looks as if the ball is on an invisible wire from one player's foot to another's. As for the defense, it's simply scary. Whenever Argentina's Lionel Messi or Carlos Tevez appeared on the verge of doing something in the quarterfinal, German defenders swarmed around to force a turnover or a bad shot. And when Germany is on the counterattack, look out. "In 2008, my team may not have been as consistent," Germany coach Joachim Loew said. "We were fluctuating a little bit in terms of the quality, and might not have had the quality at all positions compared to the team we have today. The players we have now are incredibly skilled technically and tactically. "Our flow is clearly superior to what we had in 2008." Germany made old rivals England and Argentina look downright silly in their knockout round games, routing them by a combined score of 8-1 to reach a third straight World Cup semifinal. Miroslav Klose has regained his old form and, with two goals against Argentina, moved into a tie with Gerd Mueller for second place on the all-time scoring list. The Germans are also showing an appealing swagger. Before playing Argentina in what's fast becoming one of the nastiest World Cup rivalries around, the Germans accused the Argentines of being disrespectful hotheads. "Self-confidence is always a good thing," Podolski said. "If you are self-confident, you can play much more strongly. We were very convincing in our win against England, and we had a lot of pressure there, too." But Spain is a more formidable foe than England. More formidable, even, than Argentina. The Spanish have lost all of two games since November 2006. David Villa has five goals - tied for most in the tournament with the Netherlands' Wesley Sneijder, and Spain's defense hasn't allowed a goal in the knockout stage. 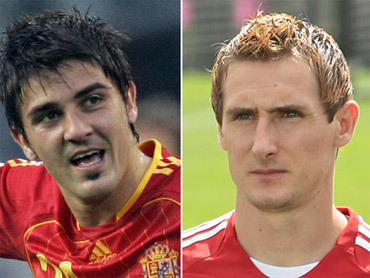 Spain hasn't had quite the same flair that it did at Euro 2008. It was stunned by Switzerland in the group stage, and needed a late goal from Villa to beat Paraguay 1-0 in the quarters after both teams had penalty kicks saved. But Spain is winning, and that's all that matters at this point in the World Cup. Spain also caught a break Tuesday, when Cesc Fabregas was able to work out with the rest of the team. Fabregas had taken a ball off the exact spot where his leg was broken in March during practice Monday night, but tests ruled out any bone injuries and coach Vicente del Bosque said he's available for the game. "I don't think there are favorites at this stage," Andres Iniesta said. "What they say about us, we can also say the same thing about them. You can say they are a great team, a team that has players of a very, very high level. For that, it will be a well-deserved semifinal." The winner earns the right to play the Netherlands in Sunday's final at Soccer City. The Dutch beat Uruguay 3-2 on Tuesday in the other semifinal.